Portion borders busy CR 54G, not recommended for young children. From Watson Lake follow trail to CR 54 G. On CR 54G trail is on south side of road. Well marked with yellow line separating trail from road. Approximately 1/2 mile cross Little Cache la Poudre Ditch and see Taylor and Gill Ditch (interprative wayside sign). Another quarter-mile, trail leaves road and meanders behing Cache la Poudre river and in less than half-mile reach Lions Park, popular spot for fishing and other recreational activities. Bellvue Hydraulic Irrigation Laboratory: Interpretive wayside. No public access to Parshall Flume. Little Cache la Poudre Ditch: Built in 1869, relatively short ditch flows 3.5 miles through Laporte toward Fort Collins. Taylor and Gill Ditch: Built in 1866, flows two miles sharing a quarter-miles with Little Cache la Poudre Ditch. Trail is built to Summit View Drive on east edge of Fort Collins, about half a mile from I-25. From Lions Park ride under Overland Trail Road next to river. Immediately go up ramp to bridge which provides excellent view of river. Particularly compelling in late May and June when snowmelt swells waters of Cache la Poudre River. 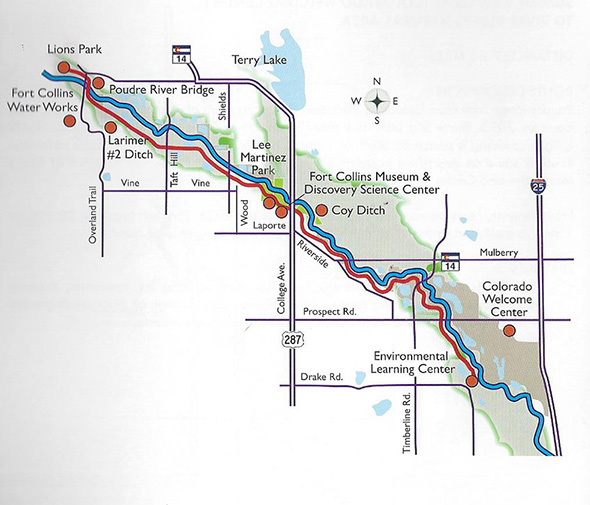 Trail continues next to river through northern and downtown Fort Collins. Across College Ave, on left is canoe chute and headgate of Coy Ditch. Ride past grain elevator and golf course to Lemay Ave. Go under Mulberry Street. About 3/4 mile east on left are remnants of Great Western Sugar flume. Spring Creek Trail joins Poudre Tail. Trail is next to river and then parallels Prospect Road. Great Western Sugar Flume: Built between 1903 and 1929. Nicknamed “Brooklyn Bridge,” distinctive appearance mimics a suspension bridge. One of very few remaining structures that relate directly to sugar beet industry. During the 1890s, sugar beets were important irrigated cash crops in northern Colorado. Fort Collins Sugar Factory (later Great Western Sugar Factory) was built in 1903 to process beets into sugar. Processing method used lime to extract sugar, which produced a waste product called “lime sewage.” To dispose of it, the flume carried lime sewage from factory to lime pits located across Cache la Poudre River. Still hot from processing, it was cooled in those pits. Lime settled out and water was wither returned to river or reused in refining process. Great Western Sugar Factory served northern Colorado from 1904 until 1955, when it closed. Processed 2.5 million tons of beets to produce 364,000 tons of sugar annually. There is a bike lane from Summit View Drive to Timnath (3 miles). Traffic is light, so riding is pleasant. South of Timnath the bike lane is wider, allowing for a safe ride. Great views of Rocky Mountains and Cache la Poudre River, particularly south of Timnath. From Timnath, continue south on CR 5 for 2.5 miles to CR 32E. Turn left (east) on CR 32E for 1 mile to trailhead at the River Bluffs Open Space on south side of road. River Bluffs Natural Area: The trailhead features parking lot, restrooms, drinking water picnic sites and river access. Trail follows along bottom of bluff skirting edge of irrigation alfalfa field. Trail goes under Hwy 392 into Windsor. 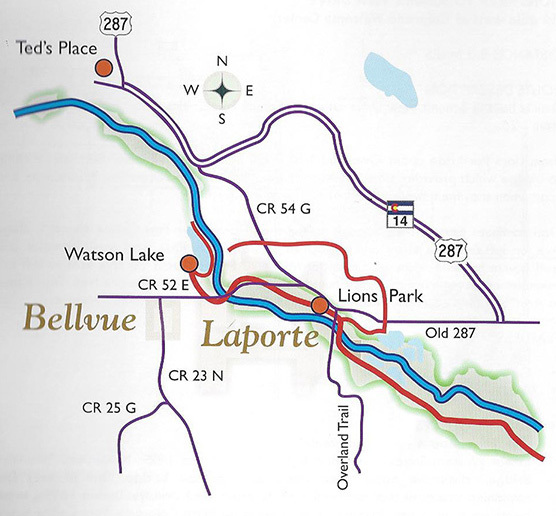 From Hwy 392 underpass travel between two lakes another mile to intersection with CR 13. Cross CR 13 with slight jog to right (south) to trailhead and continue east through Eastman Park, under CR 17, through Water Valley* (appears as sidewalk) and cross Hwy 257 (at-grade) with activated signal). Trail jogs south to Kodak Trailhead and continues east. Trail stays within view of river where a beautiful riparian cottonwood forest dominates the vegetation with high bluffs to south, spectacular views of mountains (when traveling west), skirting cornfields and industrial facilities to the north. Trail crosses Poudre on 100-foot long bridge with a great view of river. Picturesque W.R. Jones Ditch is marked by an interpretive wayside. Trail crosses 95th Ave and jogs to south and then east before reaching Poudre Learning Center. 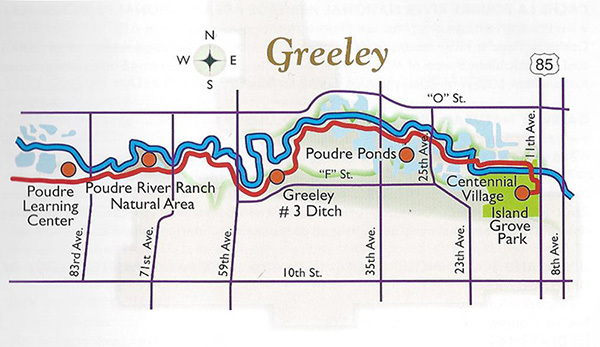 *Attention: Through Water Valley carefully follow designated Poudre River Trail route as some areas are restricted. 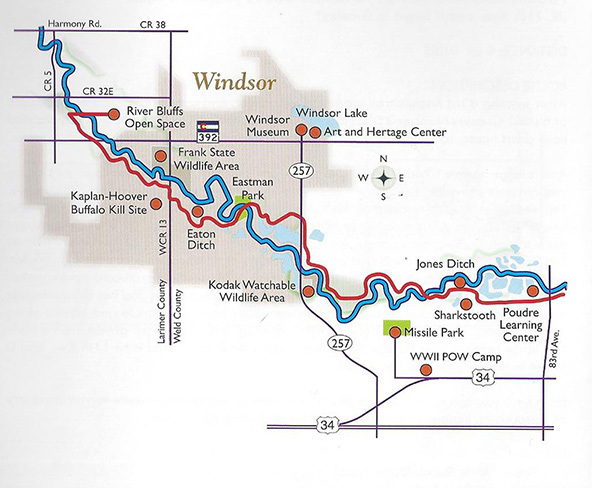 For other hiking/biking trails in the Windsor area, visit windsorgov.com for a trail map. After crossing 83rd Ave trail is adjacent to housing and natural open space. Headgate of historic Greeley No. 3 Ditch located in this section with interpretive wayside located near chart house, roughly half way between 83rd Ave and 71st Ave. Trail swings north at Red Barn Trailhead before crossing 71st Ave. Continues along embankment providing great views of Poudre River then goes under orad at 59th Ave. This section is subject to flooding during high water events, such as spring run-off and heavy rainstorms. Agter crossing under bridge trail turns south to No. 3 Ditch and turns back to east. Follows along canal, turns north and east along edge of hayfield. At Rover Run Dog Park trail turns north and crosses a variety of landscapes – pastures, cornfields, and river shaded by magnificent cottonwood trees. It crosses BNSF railroad tracks, akes a quick jog west then north again. As it follows river, curves to east and lies between river on north and gravel lakes on south. 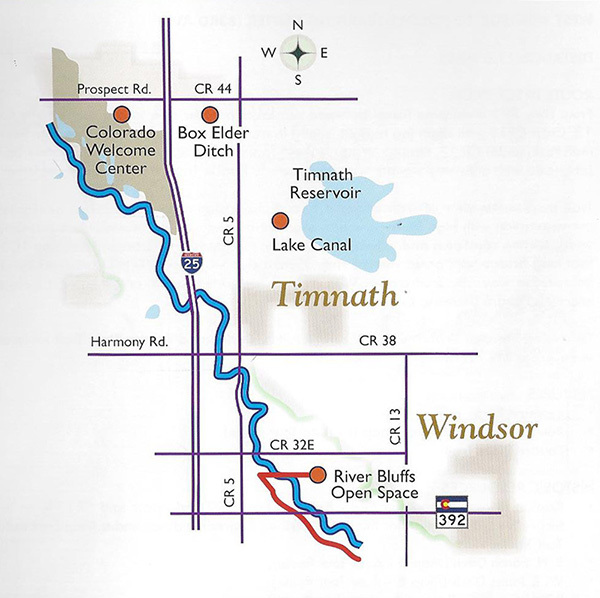 Trail crosses 35th Ave at-grade and travels along Poudre Ponds, a recreational fishery. After crossing 25th Avenue at-grade, trail crosses two large bridges over Poudre River. The eastern terminus of trail is at 11th Ave and D Street in Island Grove Regional Park. From here you can access historic downtown Greeley via on-street route to visit a variety of restaurants, museums, recreation facilities and more attractions.